Last Saturday - September 17th - marked the first anniversary of the day that has changed the landscape of college hockey. It has been full speed ahead for Penn State hockey since the day that Kim and Terry Pegula formalized the $88 million donation that has funded the men's and women's hockey programs and the soon-to-be-built Pegula Ice Arena. No one has been running at a higher speed than Joe Battista. Come to think of it, JoeBa only has one speed. Somehow, I was able to get Joe to sit still (more or less) for a lengthy interview in which he looks back the past year, at what lies ahead and some memories of his more than twenty years of involvement with the Icers. In this first segment, Joe talks about the impact of the Pegula gift on the college hockey landscape. By any measurement, it's a long way from the beaches of Southern California to the campus of Penn State University. Roughly 2,500 road miles from there to here - about the same distance I traveled (twice by car and once on a motorcycle) from Toronto to So-Cal back in my younger days. For freshman goalie P.J. Musico, that trip has been even longer. Over the past three seasons Musico has played in New Jersey in the EJHL, then halfway across country in Wichita Falls of the NAHL and finally north of the 49th parallel to Flin Flon, Manitoba (home of Flyers Hall of Famer Bobby Clarke) and a season in the Saskatchewan Junior Hockey League. P.J. has joined Yorba Linda, CA native Taylor Holdstrom on this year's Icers roster. I spoke after Tuesday's practice with the well-traveled netminder about adjusting to classes and campus life, as well as the competition between himself, Tim Carr and Matt Madrazo. Coach Guy checked in on the goalie competition, along with an early wake-up call for the troops and his trip with Joe Battista to Buffalo for the Sabres' first pre-season game. Speaking of JoeBa, I also sat down today with the Assistant Athletic Director "for Hockey Stuff" in a wide ranging discussion about the year that has passed since the big day for Penn State hockey and his thoughts as the Icers head into their 41st and final season as a club team. I'll be posting Joe's interview in three parts over the next few days. It has been a busy week for the members of the Penn State Icers. Not only have they been hard at work on the ice and in the classroom, they were also helping to look after their fellow students. Coach Guy and the team delivered pizzas to Paternoville last week. In addition to feeding the masses who braved the miserable weather to camp out at Beaver Stadium, they also got the kids exercising by playing a little ball hockey. Unfortunately, I don't have any visual evidence of their efforts, but the word is it was a hit with the students. One of the changes this season is the team's practice time. They're on the ice in the middle of the afternoon, making it tough at times for me to get to the sessions. Today was one of the occasions, although I was able to catch the last few minutes. I have to say that I liked what I saw. It looks like the team is quickly becoming a cohesive unit - just one week after the roster was set. Coach G. and defenseman Nate Jensen spoke to me after practice about the on and off ice week. We're just five days away from the first anniversary of the event that has led to a massive change in the college hockey landscape. I'm referring, of course, to the announcement by Terry and Kim Pegula that they would donate $88 million to fund varsity hockey and a new arena at Penn State. Flash forward to March of this year, when the anticipated formation of the Big Ten Hockey Conference became a reality. While I still maintain that Penn State's entry into the varsity can't be blamed, the formation of the B1G conference in 2013 indirectly led to the formation of the oddly-named National Collegiate Hockey Conference in July and may lead to the eventual demise of the Central Collegiate Hockey Association. One thing has not changed as the dominoes continue to fall. The University of Alabama-Huntsville Chargers, the only NCAA D-1 hockey program south of the Mason-Dixon Line, is still on the outside looking in as it slips closer to the edge of an abyss. For those of you that don't know, UAH has a history with the Icers. Kyle Rossi did his usual bang-up job documenting part of that history on his Thank You Terry blog back in February. The Chargers lost their conference affiliation when College Hockey America folded following the 2009-10 season. UAH has played an independent schedule after being denied admission into the CCHA in August, 2009. Now their situation is even bleaker, even though the NCAA has named UAH as the host school for the 2012 Frozen Four at the St. Pete Times Forum in Tampa. School administrators are looking at cutting costs at UAH, and the hockey program is right in the cross-hairs. The end result would be the end of varsity hockey and a return to club status in Hunstville. As former Charger Jared Ross put it in a letter to fellow alumni"
" ... the University of Alabama Systems is currently dealing with major budget cuts on the Huntsville campus and are very seriously looking at the possibility of completely demolishing Charger Hockey." Ross and his hockey alums and UAH fans are fighting back, with a grassroots effort underway to raise funds and convince the University of Alabama regents that hockey should stay -- at the varsity level. Hockey at UAH isn't a novelty, not anymore. It's tradition. We, as a community, cannot turn our backs on tradition, not with so much about our sport about to change in the coming years. If UAH loses their program, it is a clear message to other schools that might be a little bit off the beaten path and outside of the "traditional" hockey areas: don't bother, you won't make it. I couldn't agree more. I was in Grand Rapids in 2007 when the Chargers made their first NCAA Tournament appearance. I called the opening round game of the Midwest Regional as the second-ranked Notre Dame Fighting Irish faced unheralded UAH. The Chargers took the Irish to double-overtime before dropping a heartbreaking 3-2 decision. I remained firmly convinced that the Chargers' performance that day kept the Irish from their first Frozen Four appearance. The next night, Notre Dame had nothing in the tank as they lost 2-1 to the eventual National Champion Michigan State Spartans. This past week I spoke to as many 'Bama fans as I could, asking them to help save the Chargers. You can help as well. The "Save UAH Hockey" folks want at least 5,000 signatures of support, but they're only halfway there. Take a moment to sign the online petition. Your support could help to save varsity hockey in Dixie. The rain falling on Hockey Valley today really set the tone for the kind of day it has been. Most of us at any level of the hockey world are still trying to come to grips with the tragic news out of Russia. It is nearly incomprehensible to think of the loss of Lokomotiv Yaroslavl in the crash of the team's charter plane shortly after taking off earlier today. "Right now there is no hope. The team is gone." Reading those words from a Lokomotiv Yaroslavl team official to SovSport remains one of the more emotionally humbling moments of this incredible tragedy that's befallen the hockey world. The plane crash that claimed the lives of 43 people took a collection of good fathers, friends and peers away from us; men who made an impact in their homelands as hockey stars and, in some cases, in the NHL. "...everyone from the main roster was on the plane plus four players from the youth team.' Lokomotiv official said the entire team was on the plane because they were traveling for the 1st game of the season, a celebration." The hockey world will be mourning the loss of life for some time. The tragedy has certainly put a damper on Tuesday's news from Hockey Valley that the women's varsity team will join College Hockey America next fall - the first season of varsity hockey for Josh Brandwene's team. In addition to speaking yesterday with Josh and CHA Commissioner Robert DeGregorio, I also chatted with assistant coach Gina Kearns and Joe Battista. My plan this morning originally included writing part two of my coverage of Tuesday's press conference regarding Penn State's women's team. Then the news hit like a kick to the mid-section. A plane carrying the members of the Kontinental Hockey League's Yaroslavl Lokomotiv team crashed shortly after taking off from the Central Russian city. Early reports say the "majority" of the team, including several former NHL players, were killed. The English online edition of SovSport has updates, including news of three survivors. According to the Russian Federal Air Transport Agency, 34 people including foreign citizen were killed in Yaroslavl plane crash, not 37 as had been reported initially. Three peopke survived, all of them in grave condition. The plane had in total 37 people on board, including the crew. Yak-42 plane performed a charter flight to Minsk and belonged to Yak-Service airlines. The incident occurred at 16:02 Moscow time (CET+2). The reason is still unknown. The aircraft’s certificate was valid until October 1 this year, it was in operation since 1993. The first flight was performed ​​18 years and 8 months ago, according to the Russian News Service. Greg Wyshynski reports on his 'Puck Daddy' blog that former Flyer and Red Wings defenseman Brad McCrimmon was the head coach of Lokomotiv. 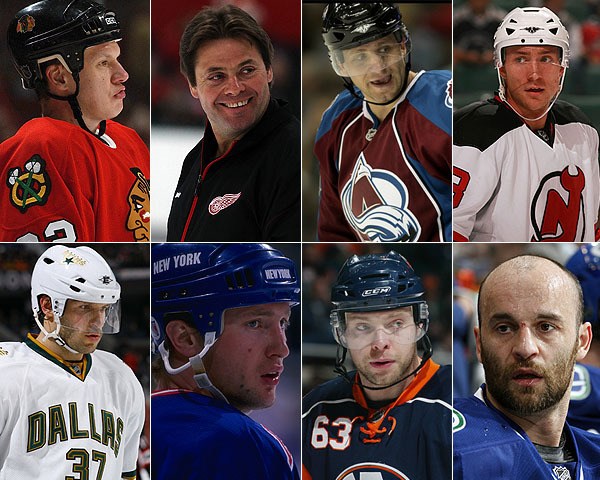 According to Wyshynski, NHL alumni on the roster included Josef Vasicek, Pavol Demitra, Karel Rachunek, Ruslan Salei, Karlis Skrastins and Detroit goalie prospect Stefan Liv. September 7, 2011 is another milestone date in the progression of hockey at Penn State. On Tuesday, the news that many were expecting became official as the women's hockey program was granted membership in the College Hockey America conference. Beginning in 2012, the first year for the women's varsity program, the Lady Icers/Lions will join perennial powerhouse Mercyhurst, as well as Niagara, Robert Morris and Syracuse in a conference that will automatically create regional rivalries and give Josh Brandwene and his team the opportunity to establish its identity right out of the gate. As conference Commissioner Robert DeGregorio explained, adding Penn State is a step forward for the conference as it seeks to expand its membership. Another school outside of the New York - Pennsylvania region (think close to St. Louis) is likely to be granted membership in the coming weeks and more could follow in the future. I had the opportunity following the press conference to speak with Mr. DeGregorio, Josh Brandwene and assistant coach Gina Kearns and, of course, JoeBa. With apologies for posting this early on Wednesday morning, here's the interviews with Josh and Mr. DeGregorio. JoeBa and Gina will be posted later today. Labor Day meant a day off for some, but not for the members of the 2011-12 Penn State Icers. Returning players and new recruits went through three days of tryouts last week, then had to wait through the weekend to learn their fate at Monday morning's team meeting. Unfortunately, the numbers meant that someone was going to get bad news. The coaches selected 15 recruits and 15 returning players for the 41st and final Icers roster (18 forwards, 9 defensemen, 3 goaltenders). That left Dan Ivanir, Mike Broccolo, "Mac" Winchester, Joe Zitarelli and Andrew Duval as the odd men out. I'm sure it's little consolation to them, but I've been there and know how they feel right now. I hope that all five men and their families know that they will always be part of the Icers family, and Barb and I wish them all the best. Once the news was delivered, the coaches wasted no time - getting the squad on the ice and getting them skating...and skating...and skating. Justin Kirchhevel was the last man standing at the end of the end-to-end drill. Come to think of it, standing might not be the best term for how Justin looked following his "winning" performance. Conditioning has always been a hallmark of Icers teams. There is no doubt that Coach Guy is stressing conditioning right from Day One. With a little over a month to opening night, teaching systems can come later. For now, it's whipping the guys into game shape. It was good to see Chris Cerutti testing his knee on the ice, but as the senior told me after practice he'll need time before he is ready for full participation. I spoke with freshman Tommy Olczyk and senior Dan Petrick as well as Coach Guy about the first official practice and the season ahead. I think it is safe to say that it has been a busy, enjoyable and even stressful few weeks for Icers past and present as well as members of the Icers family. Today's Icers are back in class and back on the ice, trying to impress the coaches and secure their spots on the 2011-12 roster. Today is day two of the three-day tryout, with the team expected to be selected after Friday's on-ice session. Meanwhile, many members of the family are still dealing with the aftermath of Hurricane Irene. I've heard from several in the past few days. The good news is that they've all weathered the storm (pardon the pun) despite some minor damage and loss of power. Irene arrived in Philadelphia shortly after a group of Icers alums as they returned to the East Coast from what can only be described as the trip of a lifetime. On August 21, the day many of us were enjoying the Icers Open golf tournament, seven Icers from the late 70's-early 80's era headed across the Atlantic to test their golfing skills on the links in Ireland and Scotland. Glenn DeStefano kept us abreast of their activities via Facebook. Now, he's provided added details of the fun. Joining Glenn were Dave Brubach, Randy Fardelmann, Ramsay Barrett, Rick O'Brien (father of current Icer Rich), Bob Holdcroft and Dave Brodie. Along on the trip were Dave Brodie's son, two of his brothers-in-law and a few of his fraternity brothers. Hmmm...hockey players and fraternity brothers. Quite the combination! We had a blast! It reminded us of the road trips we took for hockey in the old days. Played some hockey, drank lots of beer (Guinness this time) and had a laugh everywhere we went. Stayed in two houses at a Sanctuary about 45 minutes north of Dublin and played two local courses there: Seapointe and County Louth (host of several Irish Opens). Ferried out of Belfast over to Scotland to play Turnberry (awesome!) and stayed at the hotel overnight. Ferried back to Belfast and drove to play nearby Royal County Down (a course Tiger Woods called the hardest in the world!). Made it back from Dublin airport to Philly without any issues even with Irene hitting the area just a few hours after we landed. All in all, everyone agreed it was a special trip that brought back the feeling of cameraderie we experienced riding the buses back in the good ol' days. A trip like this one is one of those "bucket list" items that many of us have. To be able to enjoy it with life-long friends adds that extra touch. Thanks to Glenn for sharing with us.